It’s not about galloping on horseback across fields: working for a hunt has been a way of life for many families over the centuries. Numerous aspects of life are influenced by the role of the hunt, especially in rural areas. While hunting foxes is currently illegal, many of the hunts are still in operation and follow a pre-laid trail of fox urine, rather than the fox. Each hunt has its own livery for staff, members and followers to wear. As nearly all the work involved takes place outside, appropriate weatherproof riding clothes and boots are essential for daily chores. Smarter top boots and livery may be supplied by the hunt. May 1st is traditionally the date on which hunt staff change kennels; if they seek work in another hunt. Fox-hounds, Bassets, Harriers and Beagles, Bloodhounds, Deerhounds, Minkhounds and Fellhounds are among the different types of packs of hounds used to follow the scent on foot or horseback. Hounds are counted in ‘couples’ and an average-sized pack in the UK is made up of 20-30 couples of hounds. Master of Hounds/Huntsman is the person or persons, where there are joint-masters, in charge of a hunt. They are the figureheads who ride to hounds in front of all other riders (the field). In some cases, they also own the hound packs they hunt with. Driving hunt horses/hounds to meets. They may also be involved in the arrangement of appointments with the farrier, saddler or vet and oversee daily, monthly and annual tasks, like interviewing potential hunt employees, organising equine feed and bedding deliveries, and working with the Hunt Secretary to arrange hunt fixtures. A Kennel-man/woman has the role of overseeing the health and well being of a pack. Knowledge of hound bloodlines, breeding practices, feeding, exercising (and canine first aid) and a ‘good eye’ for the overall health and performance of the pack are among their requirements. Kennel-men and their family usually live on site at the Hunt Kennels as the working day starts very early and often finishes late! The safety and security of hound packs are also important issues. Hunt grooms are essentially jacks-of-all-trades and must be prepared to work hard for long hours (Sometimes starting at 4am).Grooms must be capable of riding all the hunt horses, along with carrying out the daily chores involved with keeping horses. 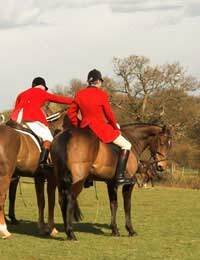 They are sometimes required to ride to hounds, if there is no whipper-in available, but are more often the ones left behind on hunting days to clear up!When other hunt staff leave with the horses and hounds, hunt grooms will be expected to have all the stables ready for the horses return. They may be asked to load a replacement horse and drive it to the meet if an animal already out is lame or injured. A good knowledge of equine first aid is useful. Grooms must be able to take responsibility for all aspects of the horses in their care and competent enough to have sole charge, or they may work with other grooms, depending on the number of hunt horses. Except when dealing with an emergency, any concerns they have about a horse’s fitness or general wellbeing are reported to the Head Groom. Grooms should be efficient at keeping records for each horse and understand the importance of correct feeding. They are also trained and experienced in all aspects of horsecare and stable management. An unusual job for the very fit! Bloodhound packs follow the scent of selected human quarry: otherwise known as cross-country runners. Not a casual jog across fields, this is serious stuff! I'm disgusted and confused as to why you are trying to position yourselves as advocates for animals, and yet you have a feature on how to work for a hunt.What on earth are you thinking?Apart from the fact that hunting is ILLEGAL, I would have thought that this does not go hand in hand with caring for animals.Just terrible!